This 2 BILLION dollar lawsuit against C hipotle Mexican Grill was filed by Leah Caldwell by herself without an attorney – she is going it PRO SE! She claims that her photo was used without her permission to promote the restaurant. It’s an interesting read, amazing amount and will be fun to follow! See the complaint below. a. The plaintiff, Leah Caldwell, PRO SE, is an individual and is a citizen of the State of California. a. The defendant, CHIPOTLE MEXICAN GRILL, INC., is a corporation and incorporated under the laws of the State of Colorado and has its principal place of business, its headquarters, in the State of Colorado. b. The defendant, Steve Ells, is an individual and is a citizen of the State of Colorado. c. The defendant, Steve Adams, is an individual and is a citizen of the State of Colorado. 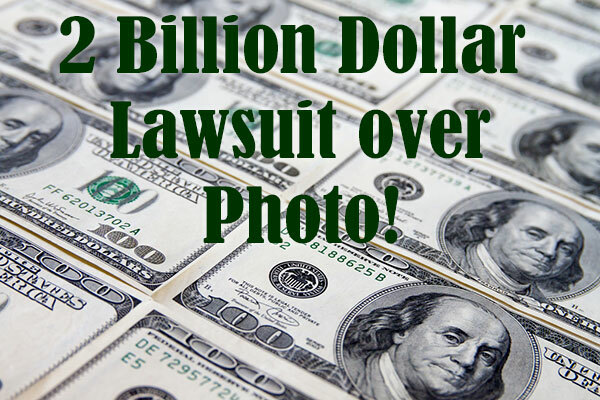 The amount in controversy – the amount the plaintiff claims the defendants owe or the amount at stake – is more than $75,000, not counting interest and costs of court because of damages for commercial appropriation of a photograph from 2006 through 2016 and because of constructive invasion of privacy. 1. Plaintiff, Leah Caldwell, PRO SE, is an individual and a citizen of the State of California. 2. Defendant A, CHIPOTLE MEXICAN GRILL, INC., is, and at all times here mentioned was, a restaurant corporation organized and existing under the laws of the State of Colorado with its principal place of business in this state, its headquarters, located in the State of Colorado. 3. Defendant B, Steve Ells, is an individual and is a citizen of the State of Colorado. 4. Defendant C, Steve Adams, is an individual and is a citizen of the State of Colorado. 5. In the late Summer-early Fall of 2006, the plaintiff was sitting inside a Chipotle restaurant near the University of Denver. When the plaintiff emerged from the restaurant, she was approached by a tall, bearded, Caucasian man who appeared as Defendant C and who asked the plaintiff to sign a release for some pictures he had taken. The plaintiff refused to sign. Defendant C however had already taken the image without the plaintiff’s consent. 6. On or around December 2pt of 2014, the plaintiff entered a Chipotle located near UCSF in Orlando Florida. The plaintiff saw the photograph upon the wall and recognized herself and her likeness in the image. In March of 2015, the plaintiff entered Chipotle franchises in Sacramento and Roseville California. At each location, the plaintiff recognized the iconic picture, her distinct photographic image and likeness even with apparent editing. Defendants’ had distorted the plaintiff’s characteristics in subsequent photos adding distortions: textures to the hair, groups of people in the background and bottles in the foreground which were not present in the original setting. 7. Plaintiff noted these bottles positioned around her image were not present when she was originally seated at the restaurant. Plaintiff considers the planting or use of photoshopping of bottles to put a false light upon her character associated with consuming alcoholic beverages. 8. 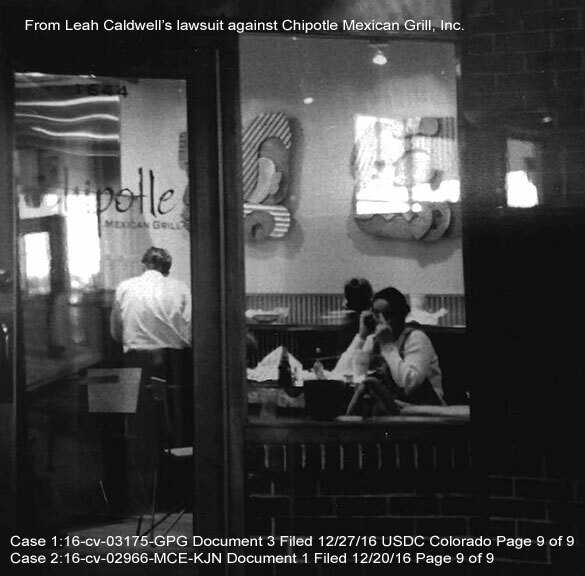 On or about September 2006, defendant C published, or caused to be published, an advertisement of the Chipotle restaurant photograph which contained the image and likeness of the plaintiff. Defendant A and B may have purchased the rights to this photograph which brands and advertises the company name and image in its restaurants as part of the franchise inventory. A copy of the production is attached here marked Exhibit A and incorporated here by reference. Defendant C may have knowingly sold rights to Defendants A and B without prior consent from the plaintiff. Defendant A and B may have knowingly not verified the existence or authenticity of Defendant C’s photographic release or lack thereof prior to its use of the image. 9. Defendant A and B knowingly included the photograph as inventory to be posted on the walls of the franchises. Plaintiff is readily identifiable and depicted in the photograph as a woman of color wearing a white, long-sleeved shirt, hair up, and large eyes looking directly at the camera. The photograph brands and advertises for Defendants, is iconic, and essential in the ·franchise image-advertising strategy. 10. Use of plaintiff’s photograph was not connected with any news, public affairs, sports broadcast or account or political campaign. 11. Defendants’ use of plaintiff’s photograph was without plaintiff’s prior knowledge or consent. 12. Defendants’ unauthorized use of plaintiff’s photograph in the advertisement of the restaurant constitutes a violation of Civ Code, 3344. 13. As a proximate result of defendants’ unauthorized use of plaintiff’s photograph, plaintiff has suffered injuries in the commercial appropriation of her image without consent and the invasion of privacy, all to plaintiff’s damage in the sum of $750. 14. As a proximate result of defendants’ unauthorized use of plaintiff’s photograph, plaintiff is entitled to damages in an amount equal to the greater of $750 or the actual damages, pursuant to Civ Code, 3344. 16. As a proximate result of defendants’ unauthorized use of plaintiff’s photograph, plaintiff is entitled to attorney’s fees and costs, pursuant to Civ Code, 3344. 6. Such other relief as may be just. 2. CHIPOTLE MEXICAN GRILL, INC., is, and at all times here mentioned was, a restaurant corporation organized and existing under the laws of the State of Colorado with its principal place of business in this state, its headquarters, located in the State of Colorado. 5. In the Fall of 2006, Defendant C captured a visual image of the plaintiff in a manner that is offensive to a reasonable person engaged in the personal activity of eating in a nearly empty restaurant with no visible cameras, no announcements of a photo shoot and no alcoholic bottles positioned nearby such that plaintiff had a reasonable expectation of privacy. 6. Through Defendant C’s use of a visual-enhancing device (camera lens) regardless of physical trespass, a constructive invasion of privacy occurred because this photographic image could not have been achieved without the use of a visual enhancing device. 7. Defendant C committed constructive invasion of privacy with the intent for commercial gain as evidenced by a contract or the transfer of ownership to Defendants A and B. Defendants are therefore liable for up to three times the amount of any general and special damages that are proximately caused by its violation. Defendants may also be liable for punitive damages subject to proof according to Section 3294 if a partnership relationship was found as evidenced by a contract. 8. Defendants’ shall also be subject to disgorgement to the plaintiff of any proceeds or other consideration obtained as a result of the violation. *1. The sum of the company’s profits or net income spanning 2006 through 2015 from annual reports. The 2016 annual report, upon release, must be added upon release to the current $2,237,633,000. 5. Such other relief as may be just. 1. Three times the sum of the actual damages, $2,250. 4. Such other relief as may be just. Under Federal Ruse of Civil Procedure II, by signing below, I certify to the best of my knowledge, information and belief that this complaint: () is not being presented for an improper purpose, such as to harass, cause unnecessary delay, or needlessly increase the cost of litigation; (2) is supported by existing law or by a non-frivolous argument for extending, modifying, or reversing existing law (3) the factual, contentions have evidentiary support or if specifically so identified, will likely have evidentiary support after a reasonable opportunity for further investigation or discovery and (4) the complaint otherwise complies with the requirements of Rule II I agree to provide the Clerk’s Office with any changes to my address where case related progress may be sent. I understand that my failure to keep a current address on file with the Clerk’s Office may result in the dismissal so stay vigilant. Note: This complaint came from the original case document and was converted to text for easy reading and formatting and it may contain errors. Please refer to the original document available from the U.S. District Court District of Colorado (Denver) case #: 1:16-cv-03175-GPG for accuracy. Case assigned to Magistrate Judge Gordon P. Gallagher. Fresh Seafood Overnight 8 Tips for your next Job Interview!